Errors almost always indicate blockage of the pitot tube, the static port(s), or both. Blockage may be caused by moisture (including ice), dirt, or even insects. During preflight, make sure the pitot tube cover is removed. Then, check the pitot and static port openings. 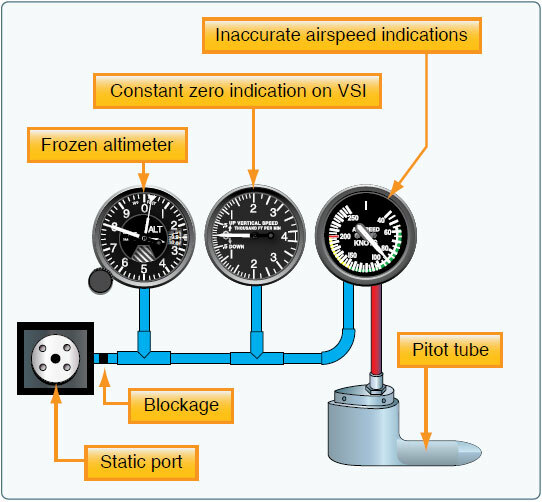 A blocked pitot tube affects the accuracy of the ASI, but a blockage of the static port not only affects the ASI, but also causes errors in the altimeter and VSI. Figure 8-9. A blocked pitot tube, but clear drain hole. If both the pitot tube opening and the drain hole should become clogged simultaneously, then the pressure in the pitot tube is trapped. No change is noted on the airspeed indication should the airspeed increase or decrease. If the static port is unblocked and the aircraft should change altitude, then a change is noted on the ASI. The change is not related to a change in airspeed but a change in static pressure. 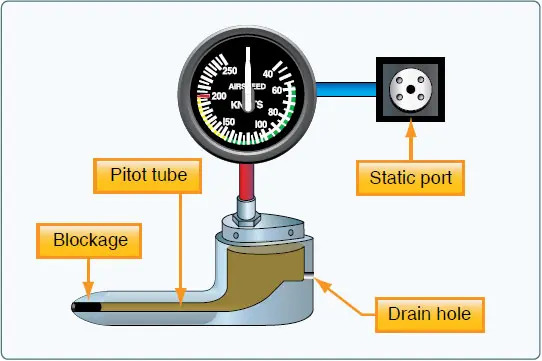 The total pressure in the pitot tube does not change due to the blockage; however, the static pressure will change. Figure 8-10. Blocked pitot system with clear static system. The ASI would be zero. Dynamic pressure and static pressure are equal. Because both dynamic and static air pressure are equal at zero speed with increased speed, dynamic pressure must include two components: static pressure and dynamic pressure. It can be inferred that airspeed indication must be based upon a relationship between these two pressures, and indeed it is. An ASI uses the static pressure as a reference pressure and as a result, the ASI’s case is kept at this pressure behind the diaphragm. On the other hand, the dynamic pressure through the pitot tube is connected to a highly sensitive diaphragm within the ASI case. Because an aircraft in zero motion (regardless of altitude) results in a zero airspeed, the pitot tube always provides static pressure in addition to dynamic pressure. Therefore, the airspeed indication is the result of two pressures: the pitot tube static and dynamic pressure within the diaphragm as measured against the static pressure in the ASI’s case. The pitot tube may become blocked during flight due to visible moisture. Some aircraft may be equipped with pitot heat for flight in visible moisture. Consult the AFM/POH for specific procedures regarding the use of pitot heat. If the static system becomes blocked but the pitot tube remains clear, the ASI continues to operate; however, it is inaccurate. The airspeed indicates lower than the actual airspeed when the aircraft is operated above the altitude where the static ports became blocked because the trapped static pressure is higher than normal for that altitude. When operating at a lower altitude, a faster than actual airspeed is displayed due to the relatively low static pressure trapped in the system. Revisiting the ratios that were used to explain a blocked pitot tube, the same principle applies for a blocked static port. If the aircraft descends, the static pressure increases on the pitot side showing an increase on the ASI. This assumes that the aircraft does not actually increase its speed. 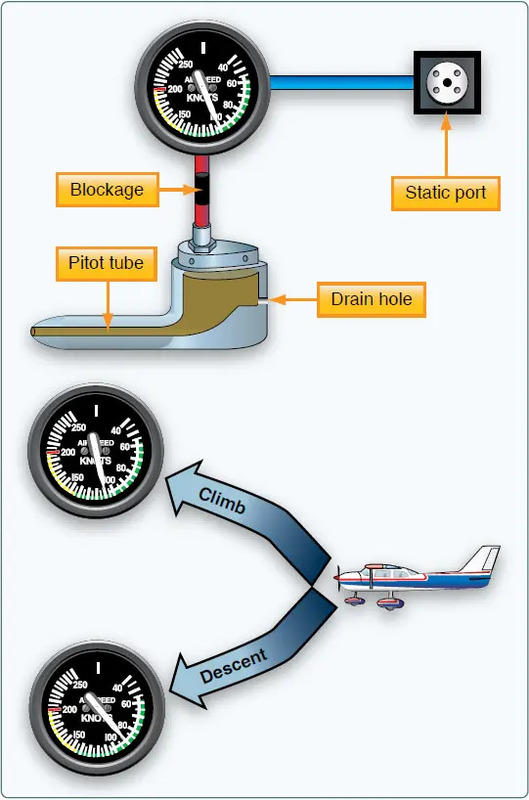 The increase in static pressure on the pitot side is equivalent to an increase in dynamic pressure since the pressure cannot change on the static side. If an aircraft begins to climb after a static port becomes blocked, the airspeed begins to show a decrease as the aircraft continues to climb. This is due to the decrease in static pressure on the pitot side, while the pressure on the static side is held constant. Figure 8-11. Blocked static system. Some aircraft are equipped with an alternate static source in the flight deck. In the case of a blocked static source, opening the alternate static source introduces static pressure from the flight deck into the system. Flight deck static pressure is lower than outside static pressure. Check the aircraft AOM/POH for airspeed corrections when utilizing alternate static pressure.